It’s actually not so hard to believe that this Chanel-style jacket project has been sitting on the shelf for, hmmm, let’s see… just about 1 year! It’s complicated and ambitious. I don’t need it, but I would like to someday make it. The planning is done so there’s nothing but grinding work ahead. Nevertheless, some progress has been made quite recently (read: this week). And all because the Chanel Jacket Club at work is now going to do a personal fitting session with the designer of the pattern we’ve all chosen to work with. Yay! This is too good of an opportunity to pass up. Fitting was always going to be the most painful part of the process. Susan is a Threads magazine contributing editor and couture expert. She collaborated on the design of her pattern with a well-known fashion draper in Paris. It has fewer moving pieces than the Vogue pattern and the princess seam goes into the shoulder, not the neckline, which will make bust adjustments easier. It’s designed without an overlapping closure in front; instead the jacket edges meet at center front and close with hooks and eyes. I’ll have to hack it to create a front button placket and a stand collar, because I still want those features. However, the rest of the work on this jacket, particularly fitting, promises to be surprisingly simpler than I expected. That’s because when I made the muslin and tried it on, the bust apex level and waist level appear to be correct for my torso. This NEVER happens! (Well, unless it’s a petite-proportion pattern.) I don’t have any photos to prove this, so take my word for it. Some fitting changes will have to be made to the circumferences to accommodate my full bust, pudgy waist, and broad hips/bottom. The muslin ran long on me, too, hitting me about mid-thigh–which I actually really love! It looks much more modern than if it hit me mid-hip or upper hip as designed. I may want to make one to that shorter length, but for my first one, I’m going with the longer length. It’ll look killer with skinny jeans/leggings or tapered trousers. The sleeves were also too long and need some more circumference, but otherwise, the first muslin is a really good starting point. What was not simple about this pattern, however, is that the sizing chart on the envelope gives the finished garment measurements–not body measurements–to choose your pattern size. This isn’t a bad way to do it, actually, because it makes it easier for you to decide how much ease you want to start with. But unfortunately, it is not explained anywhere on the pattern. There are no instructions at all, because it’s intended to work with Susan’s video class; but I don’t recall her mentioning the sizing system in her video, either. If she did and I missed it, my apologies, Susan! Otherwise, the rest of the details of my jacket plans are the same. Same white-flecked black wool-blend fabric and charcoal-grey silk charmeuse for the lining. Same beautiful enameled pewter buttons with thistles on them. Same overall design concept. My design sketch. But now I’m thinking I’m going to extend the length to mid or upper thigh for a more modern look! Now I can’t wait for my personal fitting so I can actually start making this jacket! I work at a magazine about sewing. We love garment sewing and patterns and fabric. And we get kind of crazy sometimes. Like, let’s-all-make-our-own-Chanel-style-jackets-by-December crazy. With all the projects that were already in my Fall lineup, I wasn’t really anticipating taking on something that was a “someday” kind of project, but here I am, getting ready to cut the muslin for my very first Chanel-style cardigan jacket. 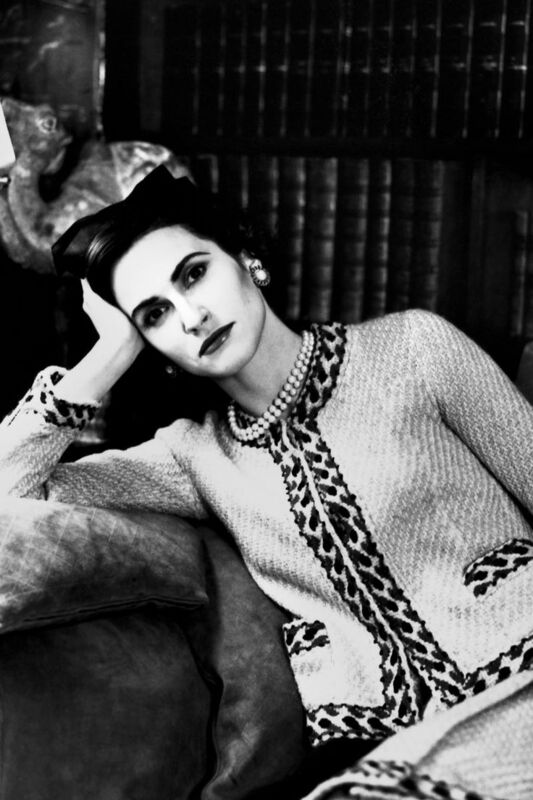 Gabrielle “Coco” Chanel, 1960, wearing one of her iconic cardigan suits. I’ll be using the newest Claire Shaeffer pattern from Vogue, #8991, a white-flecked black wool/nylon blend (mostly wool) boucle-type fabric from Hancock Fabrics, charcoal grey silk charmeuse for the lining, and gorgeous pewter and black enamel buttons. It’ll be fun, right? (Right??) Luckily, we’ve formed a support group to help us get through the challenge; it’ll meet bi-weekly. Pewter and black enamel buttons from Treasure Cast. White-flecked black boucle in a wool blend (mostly wool), and charcoal-grey silk charmeuse for the lining. 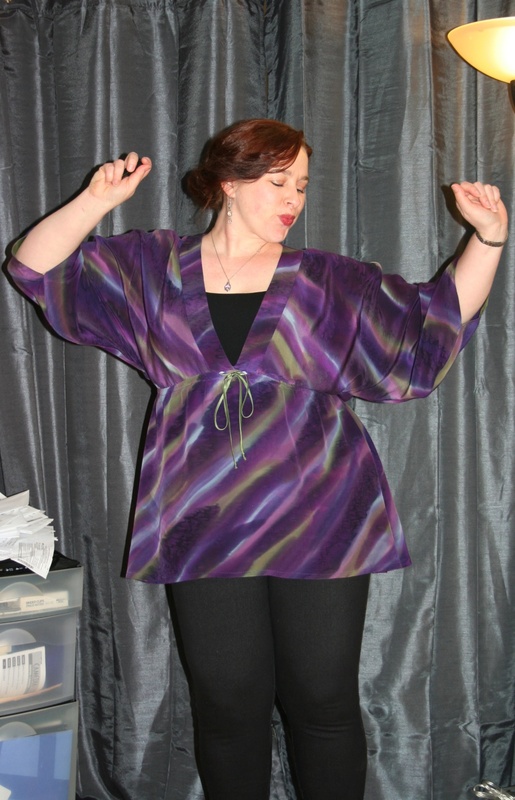 Vogue 8991, a Claire Shaeffer-designed pattern. So far I’ve focused on planning and picking my fabrics and details, which is how I roll with sewing projects–get all the major decisions out of the way up front and have a clear design concept. Recently I cut the pattern pieces apart, and I’ll start tracing and adjusting them soon. 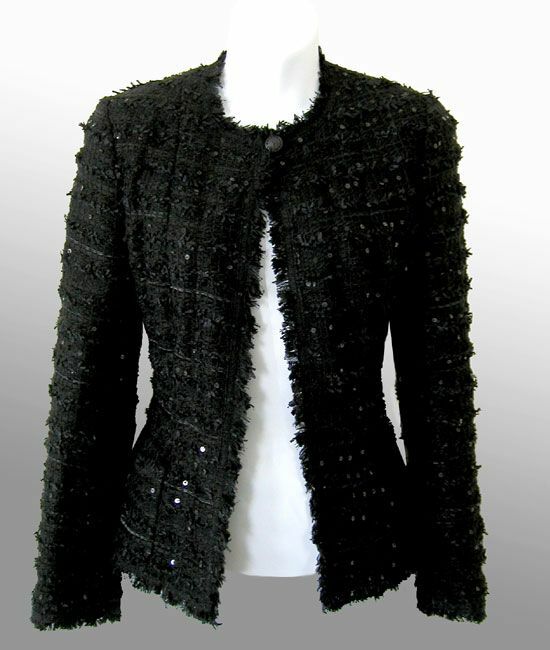 My primary inspiration is this black boucle Chanel jacket. 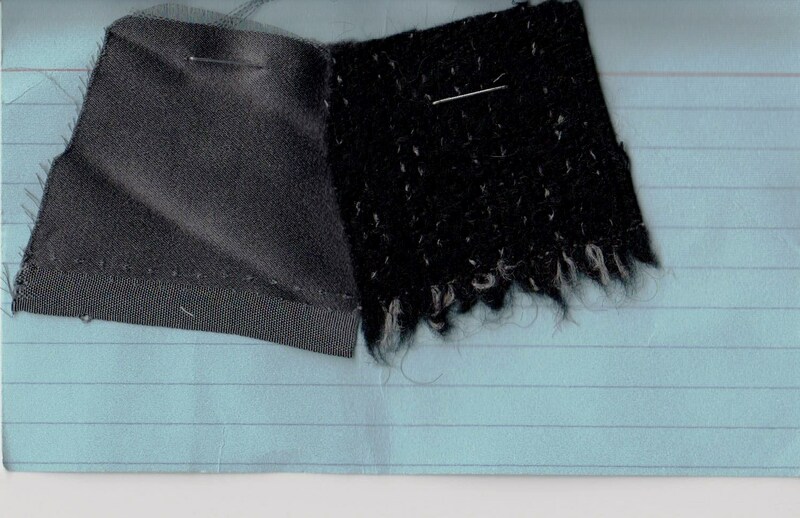 My fabric is a bit smoother, has white flecks in the black, and is not sequined. My goal is to make something sleek and modern and minimalist compared to the crazy overwrought fringe-fests of many Chanel jackets. I just don’t like a lot of fringe, although it works on many of the design house’s pieces. I don’t need to add bulk to my frame, and I prefer clean edges. 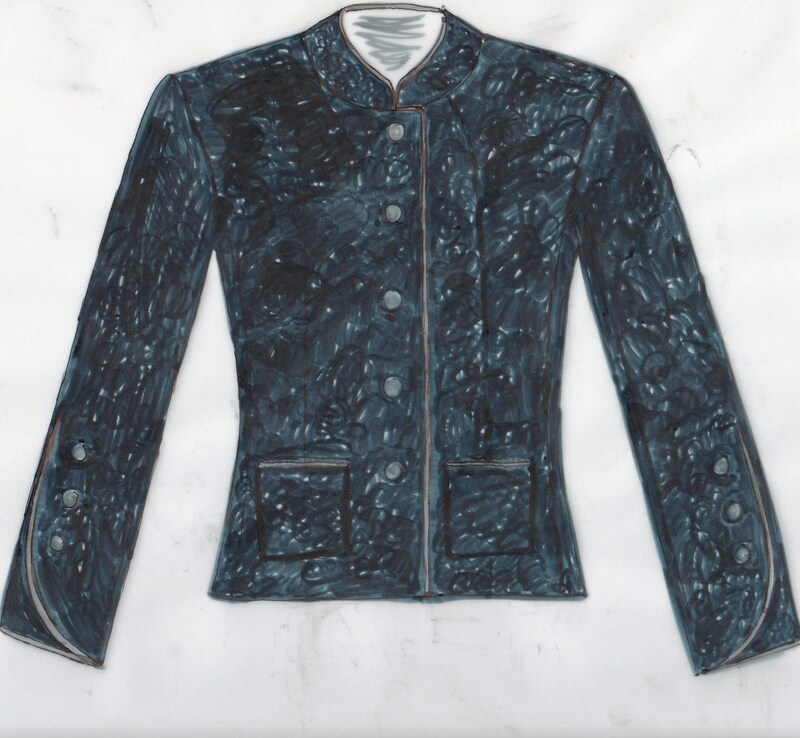 So my design plan is to make this jacket without any additional trims, zero fringe, but to have the charcoal-grey charmeuse lining extend beyond the outer fabric’s edges, folding back to the garment edge to create a kind of frame effect. This is a trim alternative frequently used by Chanel. My design sketch. Note that I’ve placed the pockets at the hip instead of just below the bust. Seriously, the pattern envelope model’s breasts look like they’re blinking.